Linn, Just Listen... Linn, based in Glasgow, Scotland, was founded in 1973 by Ivor Tiefenbrun. They are world leaders in digital streaming products as well as speakers, amplification and, of course, turntables, with the iconic LP12. Research has shown that the bearing and sub-chassis are critical in achieving the best possible musical performance from a turntable. To get the best from your turntable, the bearing must be very quiet in motion and sit perfectly stable and true to the chassis. This in turn minimises the risk of turntable platter movement with respect to the sub-chassis and arm. Even the slightest movement will introduce audible degradation to the sound and will make an enormous difference to the performance of the turntable as a whole. So, the less movement and less noise introduced here, the better! 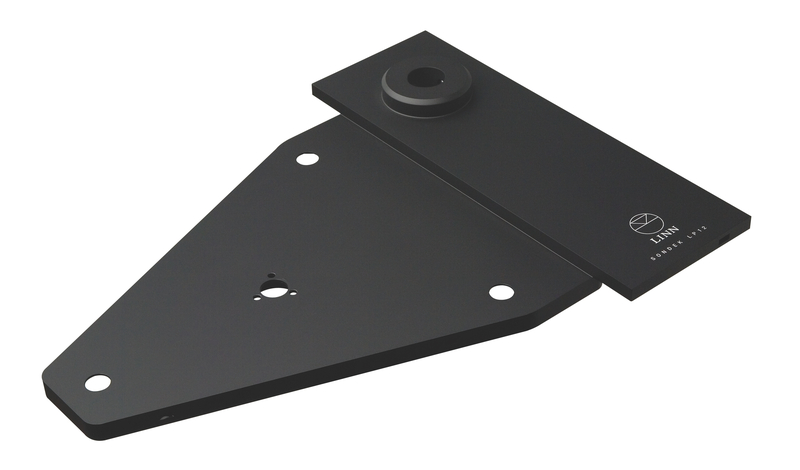 The Keel sub-chassis upgrade is an ultra-high quality machined, single piece aluminium unit that replaces both the steel Cirkus sub-chassis and the armboard, taking rigidity between bearing and arm to new levels. Consequently, the lossy interface between the steel sub-chassis and the armboard, formerly achieved with three self tapping screws, is removed. This connection between the steel sub-chassis and the original main bearing was essential in the days before the Cirkus bearing, as it acted as a filter limiting transmission of unwanted vibration and noise passing from the main bearing into the arm and cartridge. This is why, when unknowing enthusiasts replaced these small screws and the job that they were doing with larger ones, or worse still, with bolts through the sub-chassis and arm board making the connection more solid, the effect was to degrade sound quality. This is due to the increased transmission of the noise that was being produced in the original design. So, you can see that use of the Keel sub-chassis is only possible because of the improvements that were made with the Cirkus bearing. Every design aspect of the Keel affects its overall sound quality. Features such as the detail in the webbing on its underside, to the three raised areas beneath the main bearing (lands) so as to ensure a consistent contact area between it and the main bearing, all come together to create dramatic sonic improvements. This, combined with the integrated arm collar, thus eliminating the need to bolt one onto the sub-chassis with the small but consequential loss of integrity, means that the Keel is a leading piece of audiophile engineering and design for the LP12. The Keel for Linn arms is a complete and very well thought out solution, which allows so much more information retrieval from your record collection. The Kore sub-chassis and armboard is designed for extra rigidity and removal of unwanted damping, making it a perfect performance upgrade for your Sondek LP12 turntable. It follows the design philosophies developed for the Keel, but delivers a lower-cost solution at an Akurate level. 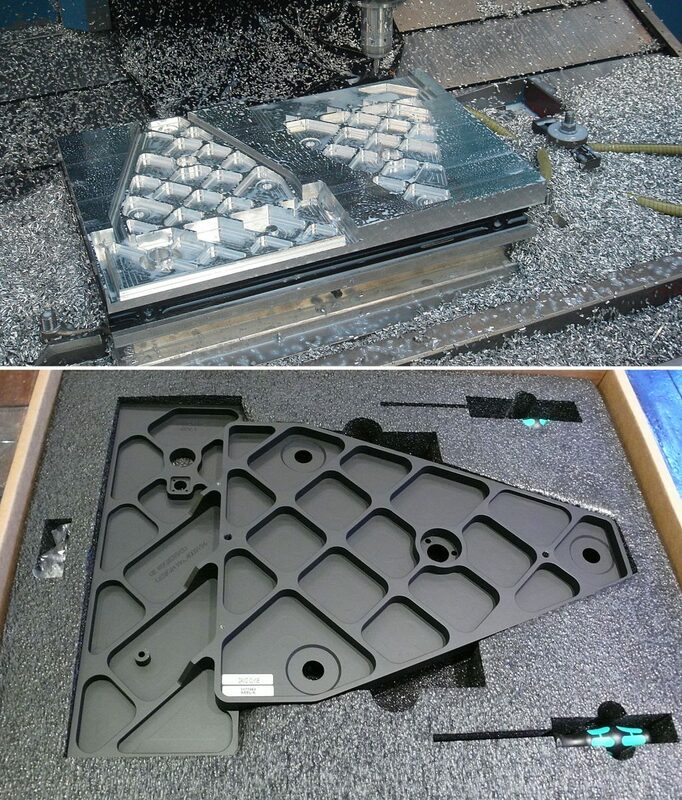 The Kore sub-chassis is very rigid, being a multi-layer box construction using 1.5mm thick aluminium. The Kore is comprised of three parts that are bonded together using a special Linn-specified adhesive, to form an incredibly stiff structure to which the armboard, machined from solid aluminium using a similar process to Keel, is then bonded. 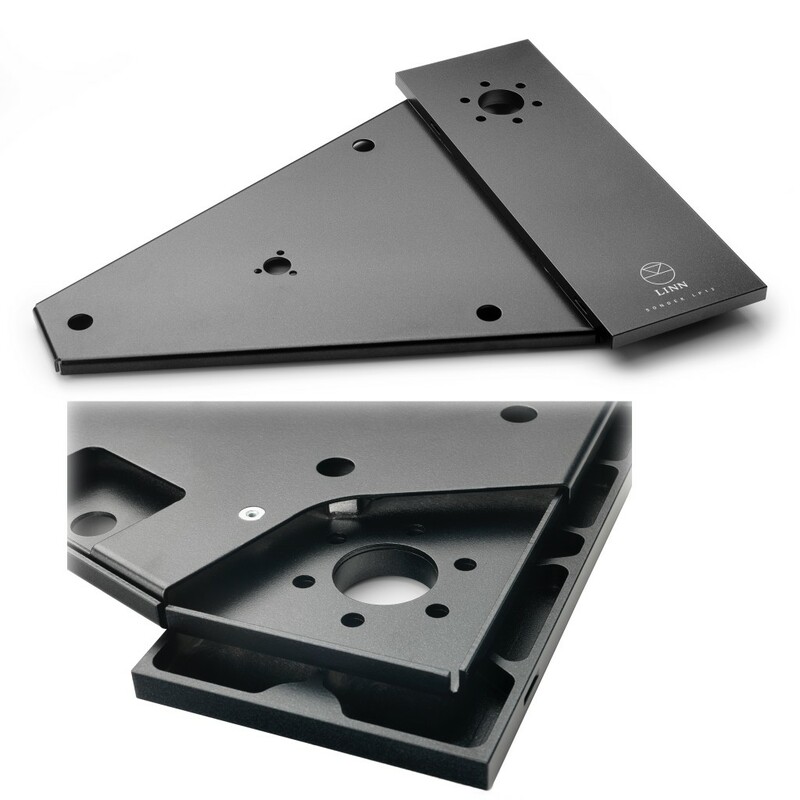 The armboard has strengthening ribs machined onto its underside, again providing excellent stiffness and rigidity, enabling the sub-chassis and armboard to exhibit the properties of a single unit. The arm has a direct connection to the main bearing, as the arm collar is effectively bolted directly to the sub-chassis. With its innovative design and, very importantly, a price that is substantially less than that of the Keel, we feel the Kore is a very exciting and important new addition to Linn’s range of upgrades for the LP12. The Kore is available in four versions: for Linn arms, the Naim Aro, plus Rega and SME type mountings. In addition to the Keel designed for use with Linn arms, Linn kindly embarked on a project to enable the same sonic upgrade to be achieved using the Naim Aro tonearm, the Aro Keel as it has come to be named. Peter Swain of Cymbiosis was instrumental in facilitating this development with Linn, from the ideas phase, right through to the supply of arms that were tested in Glasgow at Linn HQ, so as to ensure the very best results were obtained with the Aro. Given the unique nature of the Aro, the idea of an arm collar like that used on the Linn Keel was considered and rejected, as to have an integrated collar would have constituted a modification of the Aro design itself. Consequently, a flat surface just like on the standard armboard is provided for the fitting of the Aro’s arm base. The webbing on its underside is individual to the Aro Keel and is precisely optimised for the Aro. There is provision not only for the attachment of the Aro arm cable plug and arm rest, but also a specific area designed and pre-marked to facilitate the drilling of a fixing hole and attachment of Naim’s Aro arm lift called the Aromatic. Indeed this fixing area has now been utilised by Tiger Paw with their Elevator Aro arm lift, details of which can be found on the Tiger Paw page. 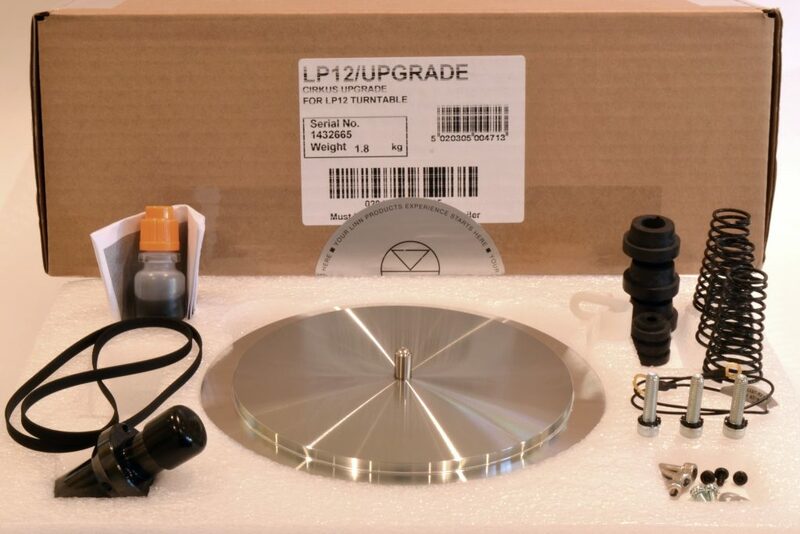 The Aro Keel allows a Naimed LP12 to be upgraded to the same performance level as a top-flight Linn LP12. The main bearing body is far more rigid than before. There is an increased distance between top and bottom liners in the bearing housing itself to make it as stable as possible, thus eliminating even the smallest amount of rocking of the spindle. An increase in the bearing oil capacity and an increase in the height of the bearing housing above the top liner so as to improve lubrication. A stiffer double laminate fixing of the Cirkus bearing to the steel Cirkus sub-chassis, which further increases the rigidity of the relationship between the main bearing and the sub-chassis and also reduces flexing of the sub-chassis itself. A new sub-platter and spindle for use with the other new parts. A kit of suspension parts including new springs, top and bottom bushes, earth wire, P-Clip, new fixing screws and washers, plus a new drive belt.